Nice but look tiny to me Yorkshire. I hope they will be ready by Christmas to be served with the Turkey. We do them although some of the family don't like them. Or send them to mE!!!!!!!! lol i lvoe sprouts! 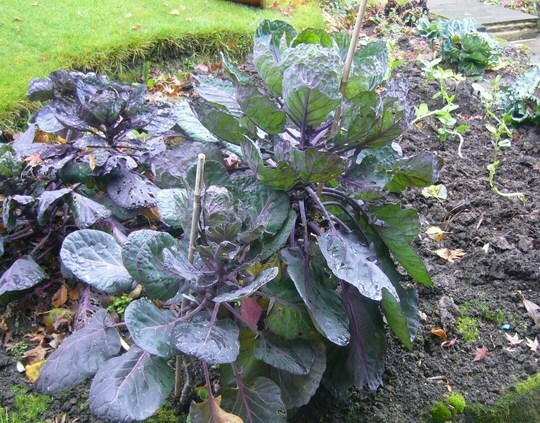 I love sprouts but have never tried purple ones!! I'd be interested to know, probably just like the green ones? Pretty enough to grow in the flowerbeds, Val. We have grown Bosworth sprouts this year, and they are scrumptious! Trying hard not to scoff them all before Christmas day. Ever tried them shredded and in stirfries? Maybe the kids would like them like that. They are wonderful. I can't say I've ever tried eating the tops, but I shall be giving them a go - can't let lovely crisp green brassica leaves of any sort go to waste. If I had to choose a favourite photo subject between flowers or veg the veg section would just slightly edge ahead, just slightly mind. Great shot of a favourite veg & nice colour. That's how the flavour develops Yorks, a Brussel is not the same without a good frost, same as Parsnips....yummy..